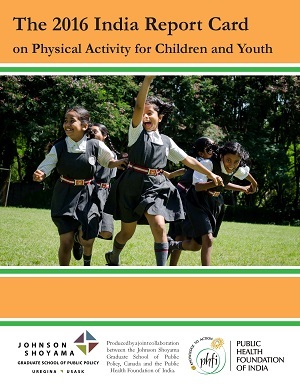 First comprehensive assessment of physical activity and sedentary behaviour among India’s young population. A professor with Johnson Shoyama Graduate School of Public Policy has led the research for the 2016 India Report Card on Physical Activity for Children and Youth. Dr. Tarun Katapally has published his findings as part of the Global Matrix 2.0, an international endeavour to compare the physical activity levels of youth and children across six continents. Dr. Katapally led the research team for India. “India’s children and youth will make up a major proportion of the world’s workforce and will drive the country’s economy. The benefits of physical activity have been well established and linked to better health outcomes, academic performance, and overall productivity,” said Katapally. The 38-country report card was unveiled this week at the International Congress on Physical Activity and Public Health in Bangkok. Katapally’s report card awarded India an overall grade of C- based on the results of 10 key indicators. The main findings show that even though India faired poorly in Government Strategies and Investments, it received slightly above-global-average grades in Overall Physical Activity and Sedentary Behaviour, and an average grade in Active Transportation. These results are intended to be used as a tool to advocate for and inform active living policies in India, and around the world. You can read the full report card here or the shortened version here. For more information and related materials about Global Matrix 2.0: www.activehealthykids.org.